As in previous article explained that how we can create the entity frame work classes and how we can use it. Now in This Session will explain you how to perform the insert update delete operation in entity framework. To display the list of records into the grid, you need to use the command in Linq query to get the records of entity framework select items. Get the records into data base through entity frame work. It will be like below; As in below code I have joined the another class also to get the consolidate response of other class. 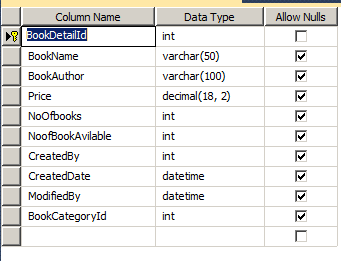 Inserting the records into data base through entity frame work. Above two lines of code help to insert the records into database. 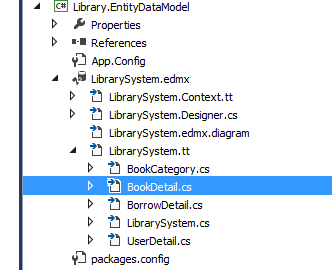 We will frame the object and call the method registerBookDetails and pass the Object of bookdetail as an argument. Updating the records into data base through entity frame work. Before call the savechanges method we need to just query the collection of entity frame work and on the result only need to find the collections and call the savechanges method. Delete the records into data base through entity frame work. Just need to query the object that you want to delet and pass that object to remove method and after that you just need to call the Save Changes method.